Despite helping fuel over a decade of good-natured parental mischief, the Elf on the Shelf craze is showing absolutely no sign of slowing down. If anything, it’s shaping up to become a real holiday tradition, which leaves lots of parents and teachers constantly in need of ideas for funny Elf on the Shelf notes and Elf on the Shelf poems. To help you in your Christmas Quest, we’ve compiled together of our best ideas below, including poems, riddles, games, and other cool ideas. ‘Tis the season once again, and the Elf on the Shelf is ready to do his duty. Here are some fun ideas for Elf on the Shelf notes that you can use to welcome the Elf back into your home or classroom this holiday season. 4. “Dear __________. Once again, Santa has sent me here. Where I can act as his eyes and his ears. Each night I’ll fly back to the snowy North Pole. If I have bad news, you might be in for some coal. But if you are good. The reward will be great! You have until the 25th. It’s a date! 8. “Dear ___________. My assignment has begun! As you know, Santa has sent me here to watch you until Christmas Day. Each night, I will head back to the North Pole to give him a full report. Are you using your manners? Are you treating other people with kindness? I’ll give Santa the whole scoop before I return each day to find a new hiding spot in the house! 13. Put the Elf next to “Santa’s Cookies.” Take a small bite out of one. 20. Use flour or glitter to make little “Elf footprints.” going toward the chimney, door, or window. 24. Help your children pack a bag of snacks for the Elf’s journey to the North Pole. 25. Have the Elf send the children on one last scavenger hunt. Have them find a goodbye note from him (remove him when they are out of the room). The Elf on the Shelf is Santa’s emissary – spending December in the house or classroom to report back to Santa just how well things are going. This means that there are many ways creative adults can have Santa “message” the children through the Elf. 26. Print up “official” looking warning letters for various infractions. When the child is “Naughty,” the Elf can deliver these write-ups from Santa’s desk. 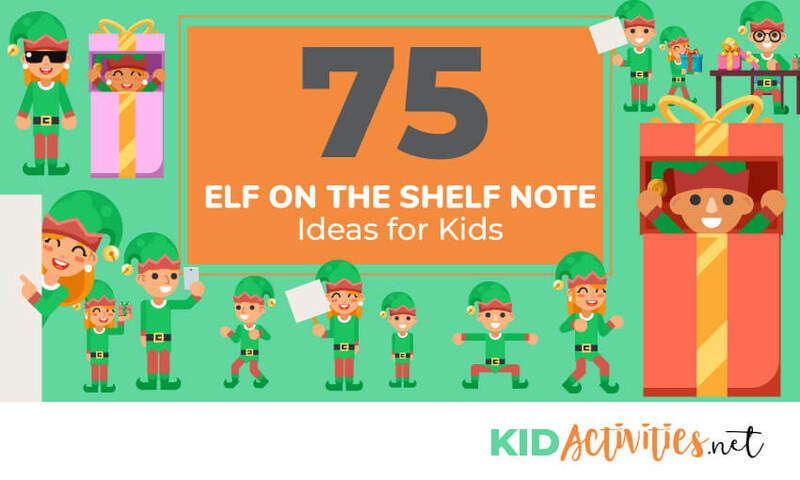 For some kids, the Elf on the Shelf works best when he’s playful and fun, and these cute note ideas are an excellent way for younger children to get engaged. 37. Hide 6 candy canes around the house. “You’ve been extra good, so I’ve hidden 6 candy canes around the house. Can you find them all? 42. Put the Elf in a hot dog bun and write out “I never sausage a terrible bed.” in ketchup or mustard. 45. “How many elves does it take to change a light bulb? 46. “Santa rides in a sleigh., but how do elves get to work? 47. “What happened Robber who got caught stealing Christmas calendars? 48. “What are Santa’s favorte potato chips? 49. “What did Saint Nick hear after his big Christmas speech? 50. “What comes at the end of the New Year? 54. “Riddle me this? How many presents can Santa fit into an empty sleigh? “Elf of the Shelf” season is a very special season in classrooms and homes all around the world. Encourage your kids to welcome him back with notes like the ones below. 56. Have the Elf write “Did you miss me?” on a whiteboard or chalkboard. Put him somewhere where the kids will see him first thing. 58. Spell out “I’m back” in M&Ms or other goodies. 59. Put the Elf inside a wrapped present and tell the child that Santa dropped something off early. 60. Tape the Elf to the bathroom mirror and write “I’m back!” in soap for the morning of Dec.1st. 63. Put the Elf on display with a “Naughty” and “Nice” list with the child’s name on it (perhaps with two boxes for him to check off. 64. Put the Elf inside of the child’s cereal box. Tell them there is a “toy inside.” You could also include a note addressed directly to the child. 67. Have the Elf holding a candy cane, with a note saying. “Say hello to your little friend!” This is more of a joke for the adults, but the kids will get a kick out of it as well. It’s a sad day when the Elf on the Shelf has to head back to the North Pole. Have him say goodbye to the children in a cute, clever, and endearing way. 73. “The last month with you has just been loads of fun! But now my job’s finished, and I’m sad that it’s done. Tonight I’ll fly back to give Santa the news. So that he can pay you a visit while you snooze. You’ve been (mostly) good, so I’m happy to say. That I think that you’re in for a great Christmas Day. We hope these funny Elf on the Shelf notes and Elf on the Shelf poems have given you lots of inspiration for this holiday season! If you have any Elf on the Shelf ideas to add, feel free to send them to us!